Striking staff have forced Ryanair to cancel 250 flights today, potentially affecting tens of thousands of passengers across Europe. A dispute over pay and conditions between the airline and staff in six European countries saw them walk out for 24 hours. Yesterday, the airline said pilots in Germany would also be going on strike, with up to 100 flights shelved as a result. The 250 cancellations is out of a total of 2,400 flights, Ryanair said. On 12 September, dozens of flights were cancelled in Germany after pilots and flight attendants refused to work for 24 hours. 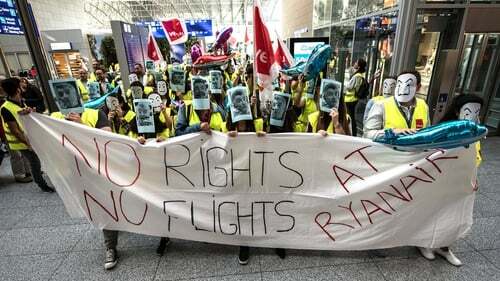 In August, several days of strikes involving staff in Ireland, Germany, Sweden, Belgium and the Netherlands saw hundreds of flights cancelled. Earlier this month, Ryanair chief executive Michael O'Leary said strikes by pilots were necessary to keep air fares down. Ryanair staff have been seeking higher wages and an end to the practice whereby many have been working as independent contractors without the benefits of staff employees. Staff claim this creates huge insecurity blocking their access to state benefits in their country. EU Social Affairs Commissioner Marianne Thyssen said on Wednesday that air crews should be employed under contracts from the country where they work. "Respecting EU law is not something over which workers should have to negotiate, nor is it something which can be done differently from country to country. I made this very clear to Mr O'Leary today," Ms Thyssen said in a statement after a meeting between Mr O'Leary and EU officials. "The internal market is not a jungle; it has clear rules on fair labour mobility and worker protection. This is not an academic debate, but about concrete social rights of workers."